As per the facts, north-eastern states of USA are gifted with high-speed Internet in comparison to other areas of the country, but this statement seems to have turned out wrong after a research was conducted. According to a report “State of Internet,” published by Akamai Technologies, surprised everyone. Virginia, a southern state, has the fastest internet service in United States with an average data speed of 13.7 megabytes per second, while Alaska with the slowest transfer speed of 7 Mbps. It is a place for housing of many presidents as well as CIA. The speed is almost twice as that of Alaska, Arkansas, Kentucky and Montana. Conclusions were from the map given by an internet service provider, Broadview Networks. The map provisioned, and average internet speed of 13.7 megabytes per seconds in Virginia followed by Delaware, Massachusetts, with 13.1 Megabytes per second. Rhode island with a speed of about 12.9 Mbps while D.C., Washington state and New Hampshire issued with12.8 Mbps, 12.5 Mbps and 12.3 Mbps respectively securing fourth, fifth and sixth position. The states of Montana, Idaho and Wyoming have very poor connection speeds. 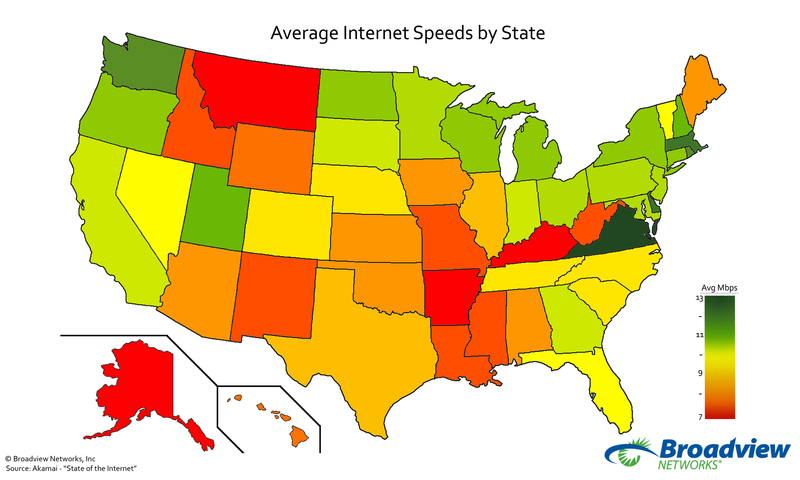 Virginia holds the top most position despite of a decline in its average connection speed. A 4.3 percent decrement was recorded on the internet speed during the first quarter of the year as compared to the last quarter of 2013. Though transfer speed of this state is just about half of the speed in South Korea which has an average speed of 23.6 Megabytes per second. The countries fastest transfer speed is just below the average speed in Hong Kong which has almost 13.3 megabytes per second and grabbing the third position in terms of internet speed globally. But according to data, it was observed that often North states had faster internet connectivity in compared to South states. With the high volume of fabricated lies emitted from DC, they need that extra bandwidth. I think you’re right. Of course, in Asian countries like South Korea and here in Japan, I can definitely see MB being appropriate. Blazingly fast. It’s great!